Phil had his first thoughts about becoming a minister when he was 10 years old. Having served in churches of all sizes since 1977, the Warings chartered Chapel Bellavista in 2000. A former youth pastor and hospital chaplain, new church planter and pastor, Phil has been recognized for his leadership in the broader community. He’s one of only a few remaining Life Members of The Disciples of Christ Historical Society. The Phoenix Jewish Federation selected him as an interfaith missionary to Israel in 1984. Phil was also chosen for a prior inspirational and educational trip to the Holy land and other Mediterranean Biblical sites led by Dr. Lloyd J. Ogilvie, the 61st chaplain of the U.S. Senate. Listening to acoustic jazz is one of Phil’s greatest pastimes. He wins those trivia contests on KJZZ radio and brought some of the valley’s jazz artists to Chapel Bellavista to enhance worship and other events. Thanks to iPhone, Pandora now accompanies him on long drives all over Arizona. A retired trumpet player himself, Phil’s most recent gigs involved playing taps at a police officer’s funeral and “God Bless America” for a Make-A-Wish charity dinner. His trumpet is now part of the brass collection at the world-famous Musical Instrument Museum. 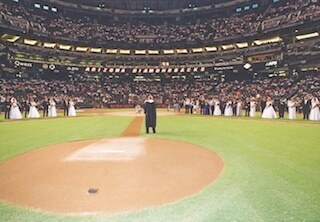 He also performed the first wedding at Chase Field with over 32,000 guests and the last wedding at Hohokom Park for some lifelong Cubs fans. Phil and Gwen are both retired volunteers for the Foothills Caring Corps. Taking home-bound neighbors to doctor appointments and driving the Corps bus to events and specialty shopping trips allowed for pleasant opportunities for service and fellowship in that community. 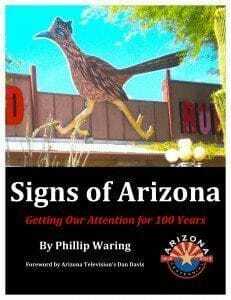 Phil authored Signs of Arizona in 2012 for the Arizona Centennial. It was designated an Official Arizona Centennial Legacy Project by The Arizona Historical Advisory Commission. Married on May 5, nearly the entire Southwest United States celebrates The Warings’ wedding anniversary. 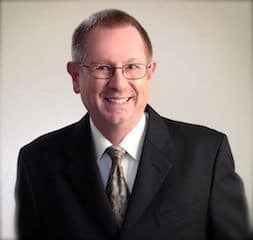 Phil retired from the the pulpit ministry in 2009 after 32 years. He and Gwen now officiate weddings and occasionally preach for churches without a minister. Gwen is the perfect partner for Phil. Working side by side with your best friend is such a blessing.